Sinus nodal reentrant tachycardia (also called SNRT) is one of the arrhythmias which is categorized as supraventricular tachycardia (SVT), which are rapid heart arrhythmias originating in the atria of the heart. 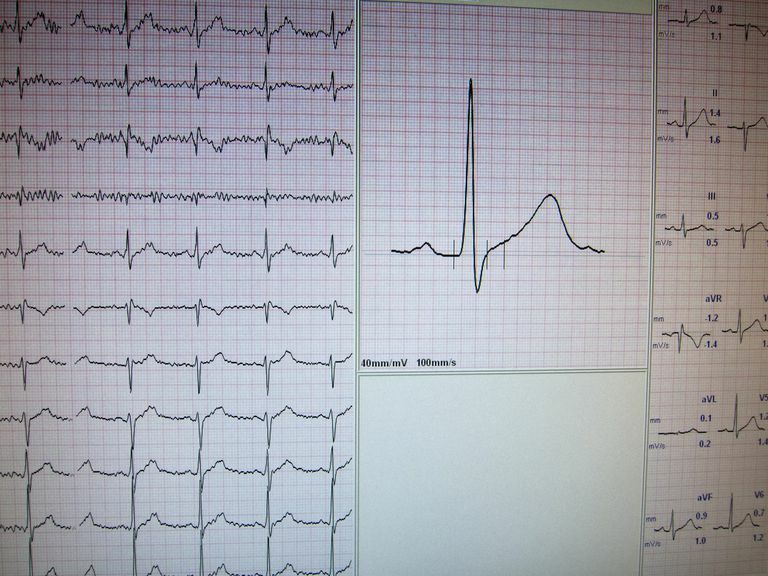 Sinus nodal reentrant tachycardia is the rarest form of SVT. Sinus nodal reentrant tachycardia is a reentrant tachycardia. As is always the case with reentrant tachycardias, sinus nodal reentrant tachycardia occurs because there is an extra electrical connection within the heart, which is present from birth. In sinus nodal reentrant tachycardia, the extra connection – and indeed the entire reentrant circuit that produces the arrhythmia – is located within the tiny sinus node. The symptoms of SNRT are similar to the symptoms most often seen with any kind of SVT. The most prominent symptom is palpitations, though some people with this arrhythmia will also experience a “lightheaded” kind of dizziness. As with most SVTs, symptoms usually begin abruptly and without any particular warning. They also disappear equally abruptly – most often after a few minutes to several hours. The sinus node is richly supplied by the vagus nerve, so people with sinus nodal reentrant tachycardia can often stop their episodes by taking steps to increase the tone of their vagus nerve, such as performing the Valsalva maneuver, or immersing their face in ice water for a few seconds. Inappropriate sinus tachycardia (IST) is similar to sinus nodal reentrant tachycardia since both of these arrhythmias arise from the sinus node. However, their characteristics differ substantially. Sinus nodal reentrant tachycardia is a reentrant tachycardia, so it starts and stops abruptly, like turning on and off a light switch; and when the patient is not having an actual episode of tachycardia, his or her heart rate and heart rhythm remain entirely normal. In contrast, IST is an automatic tachycardia. Consequently, it does not start and stop abruptly but rather, it more gradually accelerates and gradually decelerates. Also, the heart rate in most people with IST often is never actually entirely "normal.” Instead, the heart rate almost always remains at least somewhat elevated, even when it is producing no symptoms. If episodes of tachycardia are uncommon, and especially if the episodes can be easily stopped by increasing vagal tone, people with sinus nodal reentrant tachycardia may not require any medical therapy at all – aside from learning how to recognize that the arrhythmia is occurring, and how to stop it. If more intensive treatment is required – either because of frequent episodes or difficulty in terminating episodes – drug therapy is often effective. Taking a beta blocker or a calcium channel blockers will often greatly reduce the frequency of episodes, and/or make them easier to stop. If sinus nodal reentrant tachycardia is particularly troublesome and does not respond to less invasive therapy, ablation therapy is often effective in getting rid of the arrhythmia altogether. However, it is difficult to ablate the extra electrical pathway in the sinus node without also damaging the remainder of the sinus node. So the ablation procedure has a fairly high risk of producing significant sinus bradycardia, to the point that a permanent pacemaker may be required. Thus, attempts to find noninvasive therapy should always be made before considering ablation therapy for sinus nodal reentrant tachycardia. Fogoros RN, Mandrola JM. Supraventricular Tachyarrhythmias. In: Fogoros’ Electrophysiolgic Testing, 6th, John Wiley & Sons, Oxford, 2017. Page RL, Joglar JA, Caldwell MA, et al. 2015 ACC/AHA/HRS Guideline for the Management Of Adult Patients With Supraventricular Tachycardia: A Report of the American College of Cardiology/American Heart Association Task Force on Clinical Practice Guidelines and the Heart Rhythm Society. Heart Rhythm 2016; 13:e136.